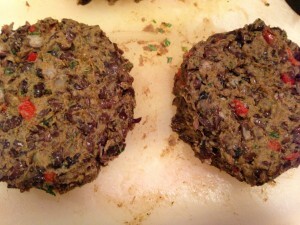 Spicy Black Bean Burgers. 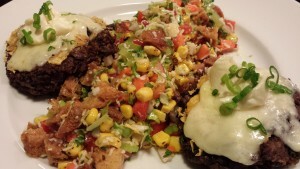 The Wildfire restaurant chain makes a very tasty black bean burger. It’s got just the right amount of spice to keep your attention. It’s served with avocado slices, Jalapeno Jack cheese, tomato and a spicy garlic aioli for some more bite. Wildfire is known mostly for its fire-grilled steaks, chops and seafood, savory salads, martinis, and special Pie-of-the-Month. I wasn’t expecting such a tasty vegetarian burger. 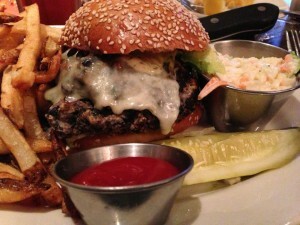 And even as a meat lover, I would order that black bean burger all over again! 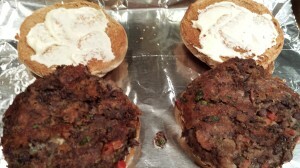 And my Spicy Black Bean Burgers are respectable stand-ins! 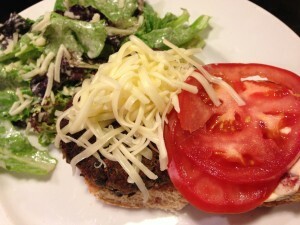 After I returned home to my own kitchen, a few days later, I decided to come up with my own black bean burger. My burger is made from black beans, roasted cumin, diced red bell pepper, crushed garlic, chili powder, minced sweet onion, breadcrumbs, chopped cilantro and a small handful of shredded Monterey Jack cheese. 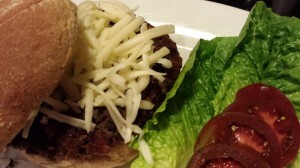 Don’t use too much melty cheese or your black bean burgers will fall apart. You can also use cheddar cheese. Mix the ingredients together while mashing some of the beans and leaving some whole beans. Form the mixture into patties that are about an inch thick so they won’t break apart when you flip them. Chill the patties for 30 minutes in the refrigerator. Warm a non-stick skillet with some canola oil. 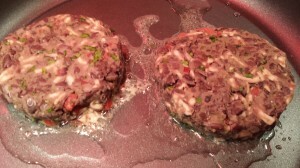 Saute or fry the bean burgers until they are browned on each side and warm in the middle. 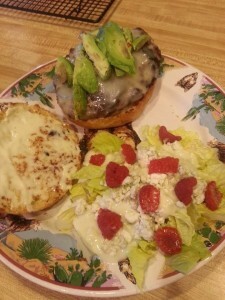 Serve on a toasted bun with sliced tomato and avocado, shredded Jack cheese, and a nice garlic aioli. 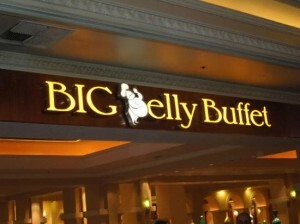 I like to serve a side salad with this dish, although you could serve fries or onion rings. 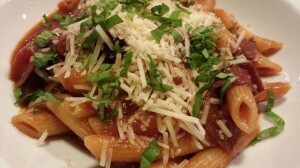 Your meat loving friends will be surprised that they enjoy this recipe! 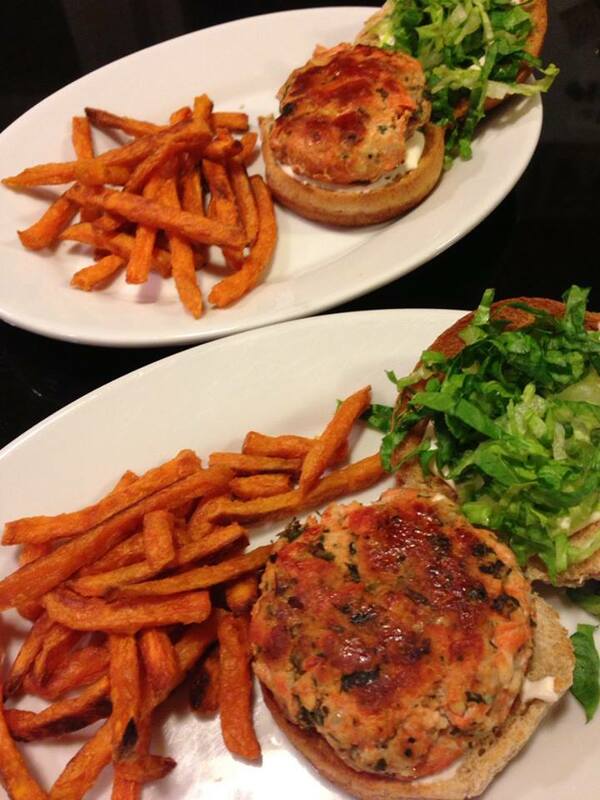 Or, make black bean sliders by forming 4 burgers instead of just two and serve bun-less with a chopped salad. 1. 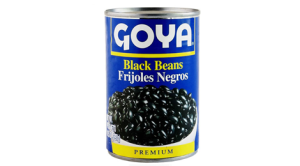 Mash the black beans in a bowl with a fork or potato masher. Leave some black beans whole. You want a dry mixture, not mushy like refried beans. 2. Mix together the beans, red bell pepper, onion, garlic, chili powder, cumin, cilantro, breadcrumbs, cheese and salt. 3. Form bean mixture into two round balls with your hands. 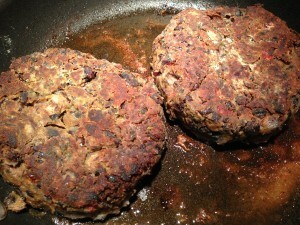 Flatten balls into patties that are at least 1 inch thick so they don’t break apart when cooking. Cover and refrigerate for at least 30 minutes. 4. Warm a non-stick skillet over medium heat and add the canola oil. 5. Remove the black bean burgers from the refrigerator. Place in the skillet. 6. Saute burgers until browned on both sides and warm in the middle, about 10 minutes. Don’t flip or handle the burgers too often in the pan or they will fall apart. Once the burgers are brown and crusty on the bottom, then flip to the uncooked side and turn down the heat to low. Leave them alone until their other side is brown and crusty and the burgers are cooked through. 7. 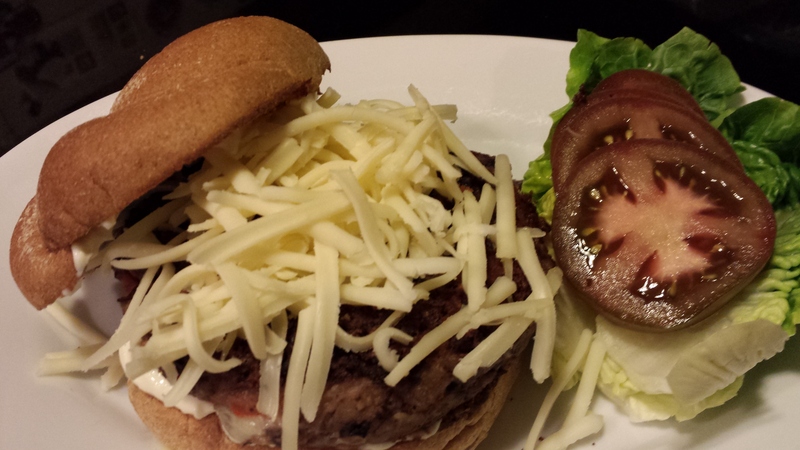 Top the burgers with the additional cheese. You can melt the shredded cheese under a broiler if you like a melty cheese, or use a cheese slice instead. 8. Serve on toasted buns with a dollop of garlic aioli. Serves 2. Offer with lettuce leaves, sliced tomato and avocado. 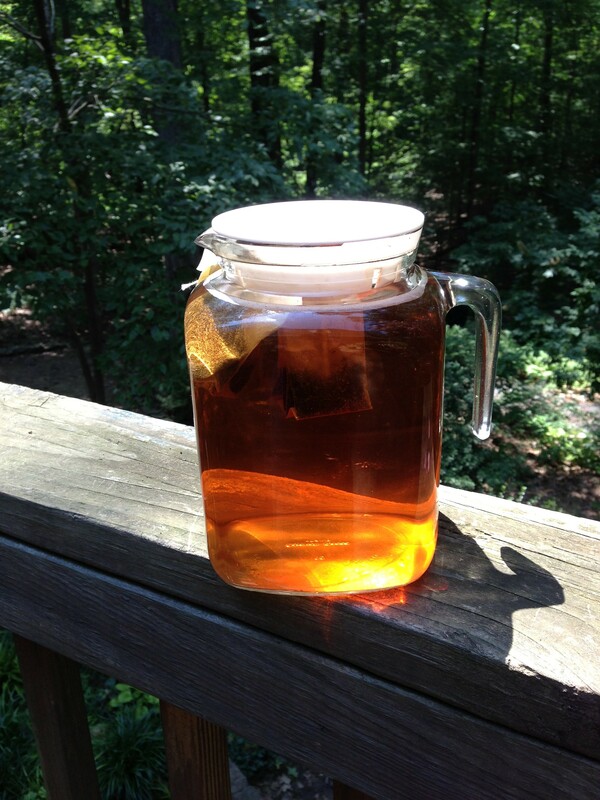 Goes great with my Colorful Chopped Salad or Simple Cucumber Salad. Variations: You can add more or less spice to your liking. Omit the cheese if you are avoiding dairy products. Substitute parsley for the cilantro. 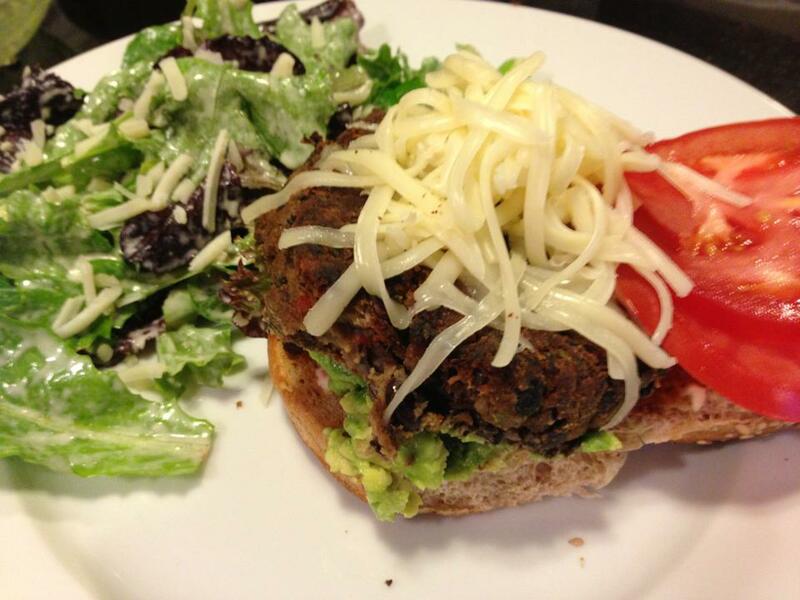 Serve my spicy black bean burgers bun-less along with a side salad for a lighter lunch or dinner entree. 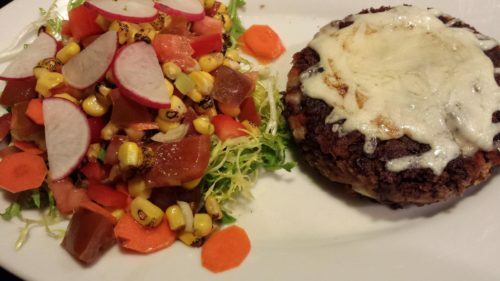 You could make Juicy Lucy burgers with a few cubes of Monterey Jack cheese in the center of the black bean burgers instead of combining the shredded cheese into the black bean mixture. Use cheddar cheese instead of the Monterey Jack cheese.